The Chicago Botanic Garden’s Seed Swap is timed perfectly. As I type this blog, there is snow covering the ground. 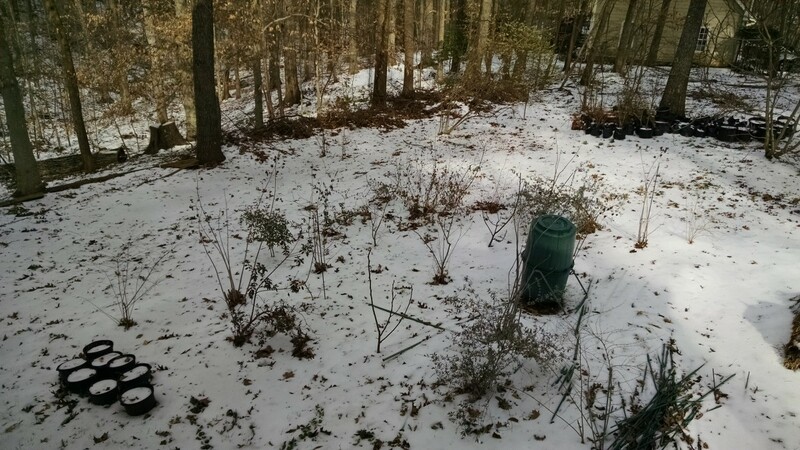 We’ve not had our mail delivered in days (this is, after all, Raleigh, N.C., where snow is a dirty word). But indoors, armed with seed catalogs, vials, and notebooks, gardeners everywhere are immersed in planning and planting. That’s why I am so excited to be bringing my tomato stories and seeds to the Seed Swap. As always, I hope to learn as much from the audience, fellow bloggers, and swap participants. One of my favorite things about gardening is the ability for all who partake to learn new and exciting things to share. It is one of those unique pursuits that no one can do perfectly or predictably. The renewal of each season fires up hope and optimism, and helps us to keep going year after year. January: the time when we dream of heirloom tomatoes. Sign up for my free lecture at the Garden on February 28. Don’t live in the Chicago area? Find more National Seed Swap Day events nationwide in January and February. Seed swaps are just marvelous events which represent far more than just entering into a fun, interactive way to build seed collections. Seeds are the future—as in flowers, vegetables, or herbs for your garden. Seeds, perhaps even more significantly, are the past. They are a direct way to pass on a bit of history, as well as a bit of your own effort, if the seeds happen to be those that you saved yourself. When passing on seeds, be sure to also pass on whatever history and information that you’ve accumulated along the way. Part of the Craig LeHoullier heirloom tomato seed collection housed with my go-to books. 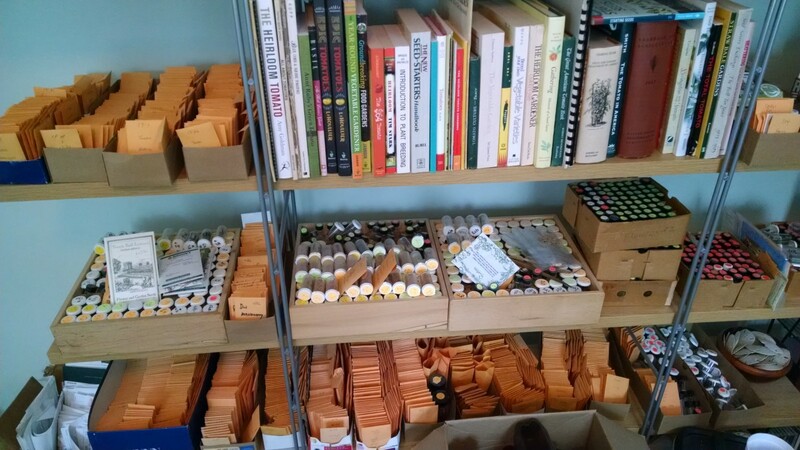 I’ve got a “small” collection of seeds saved and sent through my 35 years of gardening (if you call more than 5,000 samples of seeds small, that is). There will be some fun, interesting, historic varieties among the packets that I will bring to share at the swap event. I like to tell people that it recently came to me that heirloom tomatoes chose me to be one of their ambassadors. How else can I explain the unsolicited gifts, in the form of letters with packets of seeds, which populated my mailbox in and around 1990? Among them are Anna Russian, Mexico Midget, and two varieties that came to me unnamed—Cherokee Purple and Lillian’s Yellow Heirloom. It is a role I relish, and serve gladly and enthusiastically. I am joined in this by so many—Carolyn Male, Amy Goldman, Bill Minkey, and Calvin Wait, just to name a few of those whose books and/or seed-saving efforts have been but a small part of making this perhaps the very best time for tomato enthusiasts to paint their gardens with such an array of colors, shapes, and sizes. The LeHoullier backyard tomato garden—it doesn’t look like much now, but wait until August! The challenge of planning is that there is always more to grow than can reasonably fit. Some succeed better than others at narrowing things down. It is a good thing that tomato seeds will keep germination for at least a decade; it helps to ease the pressure of over buying. Hey—how about swapping for some of those extras! Whoops—that means I will then have even more to choose from. Great! 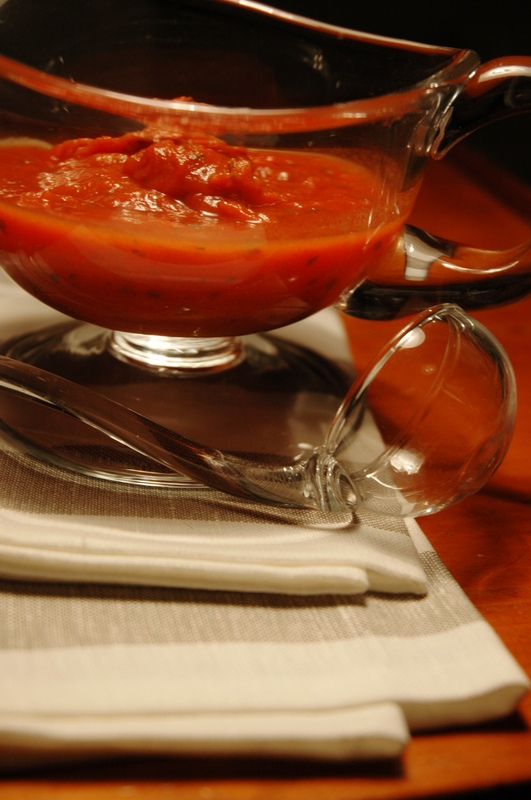 As far as what to grow, how does one navigate the confounding waters of tomato choices? Part of that answer lies in the intent of the garden—primary food source, tomato playground for testing or projects, or just one part of a greater whole with many other types of crops. There are choices of heirloom or hybrid, indeterminate or dwarf, and then the more fun projections such as colors and flavors. It all adds up to some pretty intense dreams—both during the day, and for me, occasionally while I sleep. And so, Chicago, here I come. From lunching with bloggers and sharing gardening ideas and battle scars to my main talk where I can entice you with pictures of my conquests (and challenges, because they are unavoidable), and finally some time to swap seeds and stories, ask and answer questions. I will be happy to share the list of my favorite varieties and why. 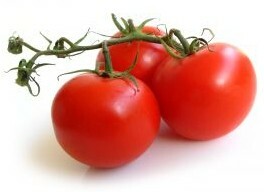 And stories—lots of stories, because many of the tomatoes I cherish, most have wonderful stories. Each summer, as I cast my eyes over my garden, I envision the faces and names of those who sent me seeds just as much as the appearance of the plants and the excitement of the tomatoes to come. 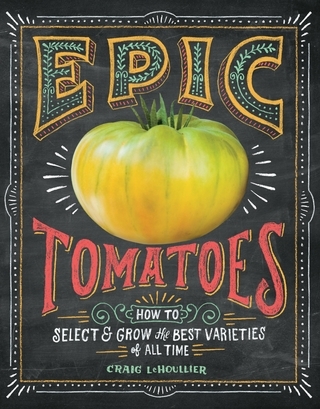 Purchase Epic Tomatoes by Craig LeHoullier in the Garden Shop! In the meantime, come on along on my journey by checking out my website at craiglehoullier.com. I will soon be blogging about seed starting, making choices, and anything else that pops into my mind. There is info about my books, my upcoming events, and the Dwarf Tomato Breeding Project, from which some swap samples will be made available. Grafted tomato plants are available at garden centers and through mail order nursery catalogs, but sell out quickly, as the idea has captured the interest of home gardeners, farmers, and professional greenhouse growers. The finished tomato graft: this will be placed into a “healing chamber” for a week while the graft seals. An ancient art and science long used on fruit trees, grafting is the placement of the tissues of one plant (called a scion) onto another plant (called a stock). The rootstock is thought to impart disease resistance and increased vigor to a less vigorous—perhaps heirloom—tomato grafted on the top, producing more tomatoes over a longer period of time. Curious about the process and whether the price tag could be justified—grafted plants run from $9 to $18 a plant—I decided to graft some tomato plants myself and grow them out. My first foray was in winter 2013. The Chicago Botanic Garden’s propagator in the plant production department, Cathy Thomas, had just returned from a conference at Longwood Gardens, where one of the topics was grafting vegetables. She willingly supported my quest and enthusiastically discussed the details with me. The process seemed fairly straightforward after we settled on which varieties to graft together. 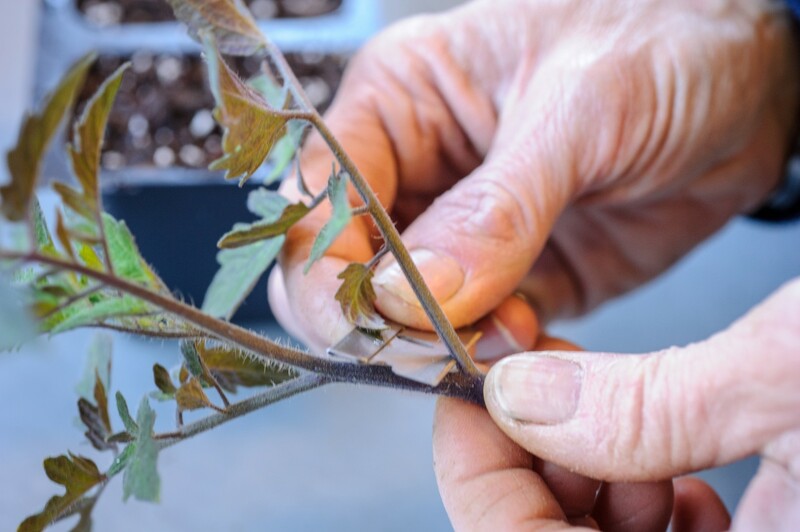 Deciding to graft the cultivar ‘Black Cherry’ onto ‘Better Boy’ rootstock, we worked with tiny, 3-inch-tall tomato starts, taking care that the top and bottom stems of each plant were exactly the same diameter at the place they were to be grafted. 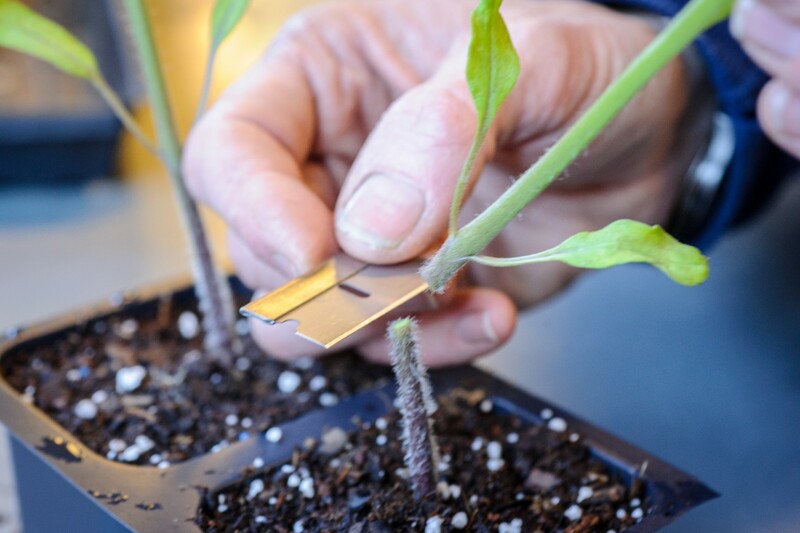 Our grafting tools included clear silicon tubing cut to 10 to 15 millimeter lengths, a new, unused razor blade, and our tomato seedlings. 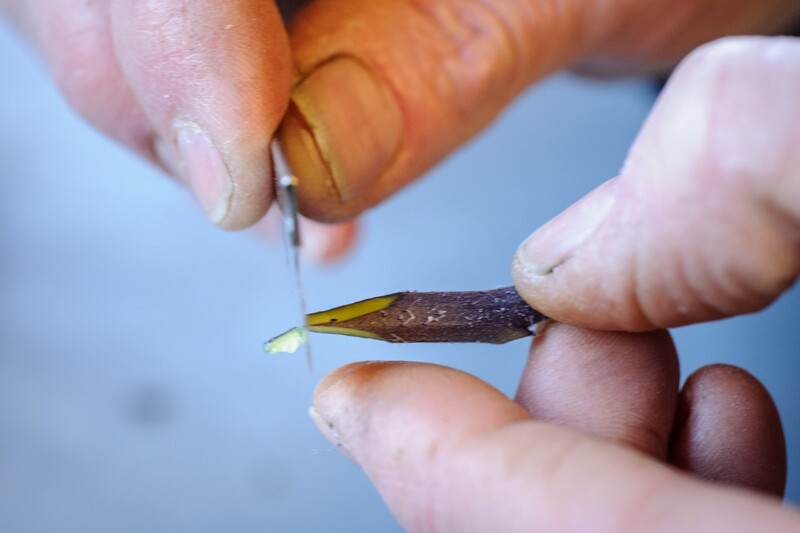 Starting by sanitizing our hands, we used a new razor blade to slice the stem of the scion (top graft plant) off at a 45-degree angle. The plastic tubing, soon to be the grafting clip that would bandage the graft union, was prepared by splitting it in half. All the leaves were removed from the scion, leaving only the meristem. (The meristem is the region of stem directly above the roots of the seedling, where actively dividing cells rapidly form new tissue.) Two diagonal cuts were made, forming a nice wedge to fit into the rootstock. The rootstock was split and held open to accommodate the scion. A silicon clip was slipped around the cleft graft. Newly grafted plants were then set into a “healing chamber,” a place with indirect light and high humidity, for up to a week. In the healing chamber, the plants can heal without needing to reach for light, which can cause the tops to pop off. 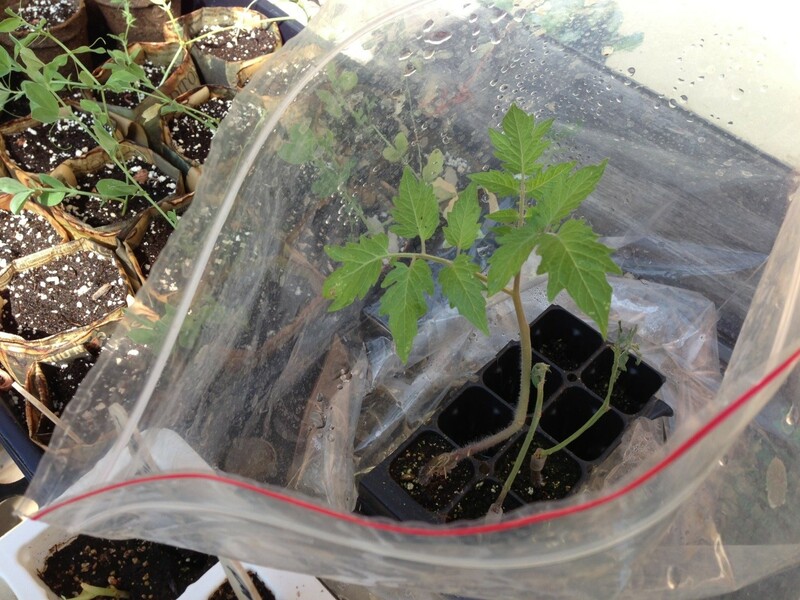 We placed our new grafts in a large plastic bag in the Regenstein Fruit & Vegetable Garden greenhouse. The healing began. Cut the root stock off at the meristem; discard the top of the seedling to avoid confusing it with the scions you will be grafting. After cutting off the top of the rootstock, user the razor to vertically slice the top part of the remaining meristem. Remove the extra leaves from the scion, leaving only the top set. Make two 45-degree cuts to the end of the scion to create a sharp tip to insert into the rootstock. 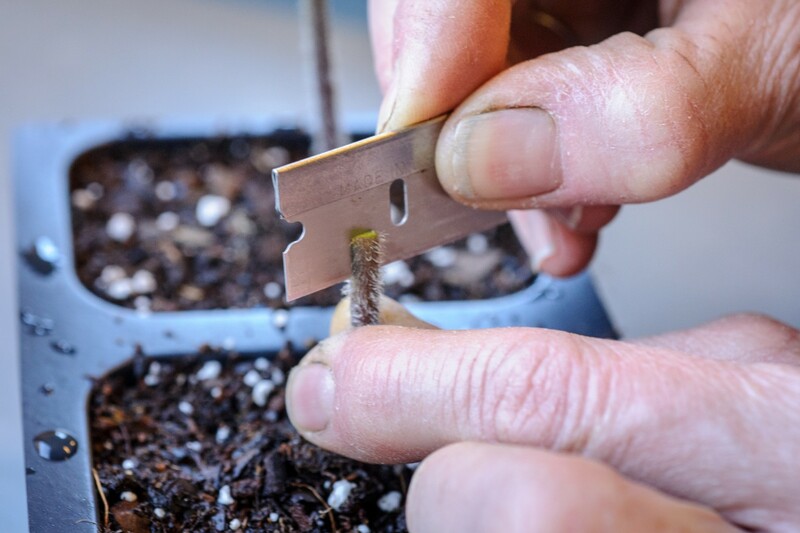 Using the razor’s edge to pry open the split rootstock, gently insert the prepared scion. Slice the silicone tubing open and wrap the cuff around the graft, entirely covering the graft to support the top plant and speed healing. Two weeks later, we had a dismal one-third survival rate! Much to my relief, the lone survivor was a superlative tomato plant in almost every way. Oh, what a strong tomato we had! My excitement rose—what if heirloom tomatoes could be as delicious and more prolific and adaptable? When soils warmed, we planted our grafted tomato out in the Fruit & Vegetable Garden, positioned right next to a ‘Black Cherry’ plant growing on its own root, so the differences would be easy to discern. Our hope was that we could address some of the ins and outs of grafting for the public, and the feasibility of DIY (Do It Yourself) for gardeners. Do grafted heirloom tomatoes have more vigor, better quality, and bear more fruit than ungrafted “own-root” heirloom tomatoes? Which has a more abundant harvest over a longer period of time? Last summer, our grafted tomato plant certainly provided the earliest harvest. Comparatively, it was earlier to fruit than the plant grown on its own root by two weeks, and was prolific throughout the season. That being said, in the organic system of the Fruit & Vegetable Garden, our soils are nutrient-rich and disease-free in large part due to crop rotation and soil-building practices. The question used in marketing “Is the key place for grafted tomatoes in a soil that has disease problems?” didn’t apply to us. Are grafted tomatoes the answer for those with less-than-ideal environmental growing conditions? For greenhouse growers unable to practice crop rotation as a hedge against a build-up of soil-borne disease, or home gardeners who contend with cool nights and a short growing season, I would say yes, I think so, but at a cost. 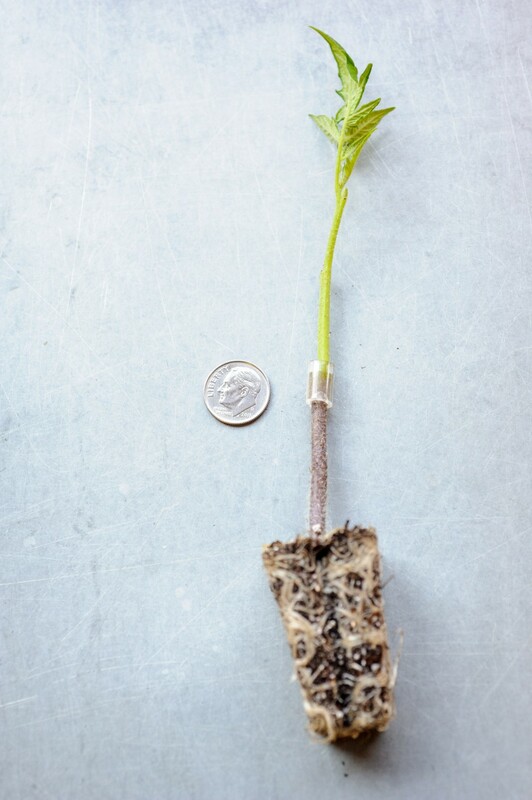 Place the finished graft in a humid location, out of direct sunlight, to heal for up to one week. 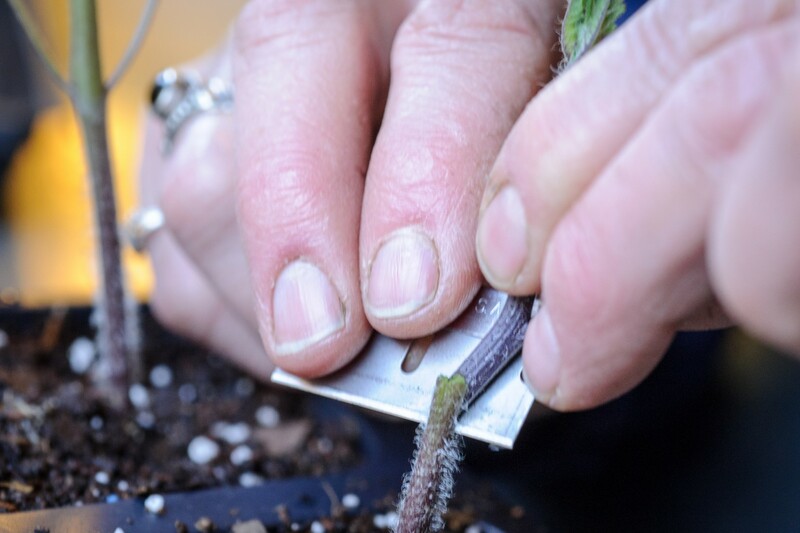 When planning on grafting, growers must buy double the amount of seed and need to double the number of plantings (to account for the graft failure rate) to maintain the same number of viable seedlings to plant. Cathy and I tried our grafting project again this spring and are looking forward to growing ‘Stripes of Yore’ and ‘Primary Colors’ on ‘Big Beef’ hybrid rootstock. 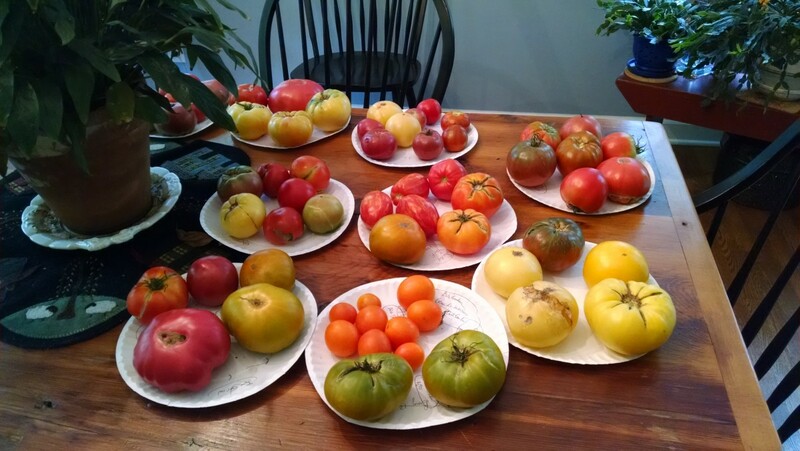 I swapped seed for these unusual varieties with a tomato enthusiast who attended our annual Seed Swap this past February. Our rootstock has excellent resistance to common tomato diseases: AS (Alternaria Stem canker), F2 (Fusarium wilt), L (Gray Leaf Spot), N (Nematodes), TMV (Tobacco Mosaic Virus), V (Verticillium Wilt). So far, three of our eight plants are viable, healed, and strong. Our “founding gardeners”— author Andrea Wulf’s depiction of early U.S. presidents who passionately promoted farming as a means to independence — would be tickled to see the American Seed Saver bed in the Regenstein Fruit & Vegetable Garden. There, visitors will find varieties of heirloom fruits and vegetables grown by our third president, Thomas Jefferson, in his country estate at Monticello, just outside Charlottesville, Virginia. Many of these varieties are also grown in Michelle Obama’s organic vegetable garden on the White House grounds. 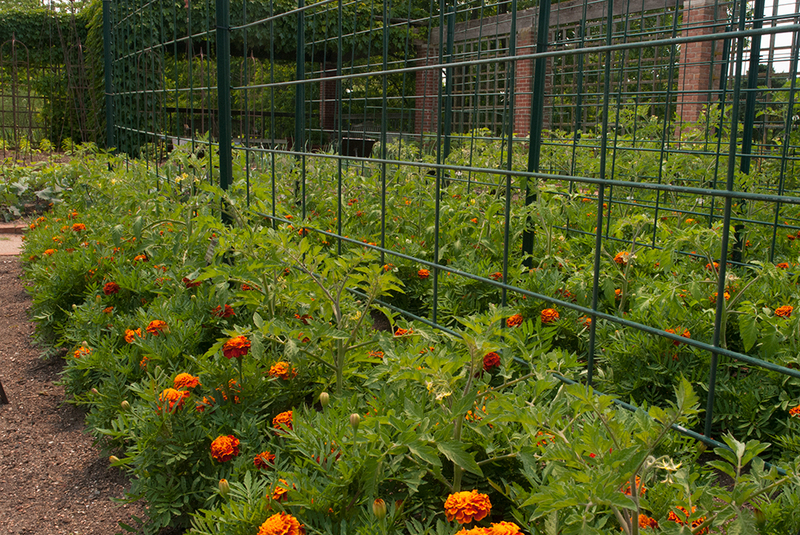 Grown together in a companion planting, marigolds deter pests from tomato plants in the garden. The American Seed Saver bed also honors everyday gardeners who help safeguard the genetic diversity of plants, according to Garden horticulturist Lisa Hilgenberg, who oversees the Fruit & Vegetable Garden. “Because of the work of home gardeners and seed-saving organizations, an increasing number of heirloom varieties are now available to the public,” she said. Learn about saving your own seeds! Heirloom vegetable varieties are open-pollinated plants that reproduce themselves, staying “true to their parents,” according to Hilgenberg. They’ve been handed down through generations, a practice that helps maintain the food crop gene pool for future generations. 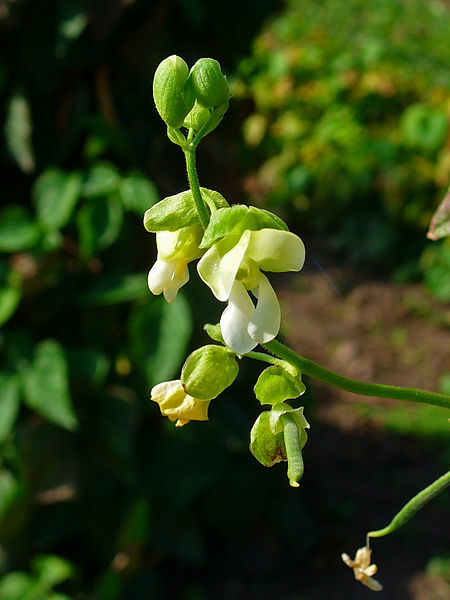 Visitors to the American Seed Saver bed can also see the rattlesnake bean (Phaseolus vulgaris), said to originate from the Cherokee people. 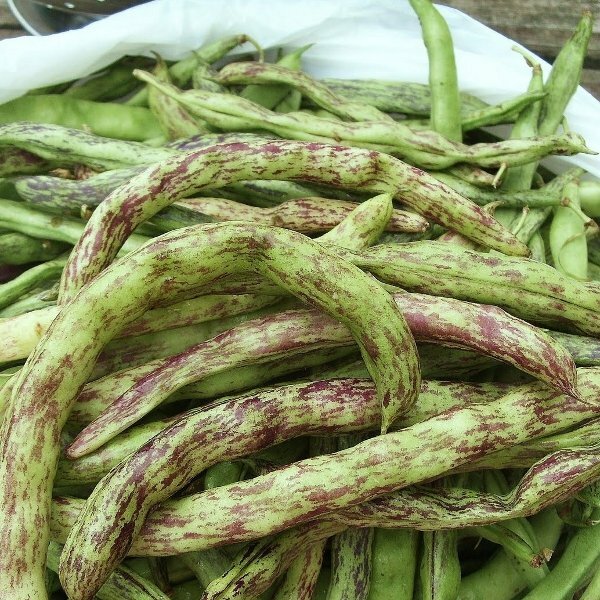 The variety is also known as the preacher bean because its abundant yield of purple-streaked green pods gives cause for thanks and praise. The nearby Painted Lady bean (Phaseolus vulgaris ‘Painted Lady’), native to Mexico, was popular in England by the 1850s and a favorite in America by the early 1880s.